Changes in gender relations may be profoundly threatening to certain individuals, resulting in their use of violent tactics to attempt to re-assert control. Symbolic targets and threats to identity privilege are more important to motivating right-wing terrorism than objections to policy or more straightforward material or economic factors. Gender hierarchies: the privileging of masculinity and its associated traits over femininity and its associated traits, whether or not these traits are attached to actual women and men, such that actors or actions marked as “masculine” have greater access to power and/or are more favored and those marked as “feminine” are marginalized, denigrated, or excluded. Patriarchy: an unequal social system where men and masculinity are highly valued and in a dominant position and women and femininity are devalued and in a subordinate position. Democratic countries with rivals are more likely to have lower percentages of women in their national parliaments. When democratic countries are involved in an international rivalry, average female political representation is cut in half, from nearly 20% to 10%; when they are involved in two rivalries, female representation falls to 4%. Gender hierarchies support other forms of hierarchy and therefore are used not only to distinguish men from women but also to distinguish between different men (through, for instance, being denigrated and disciplined with feminine name-calling). 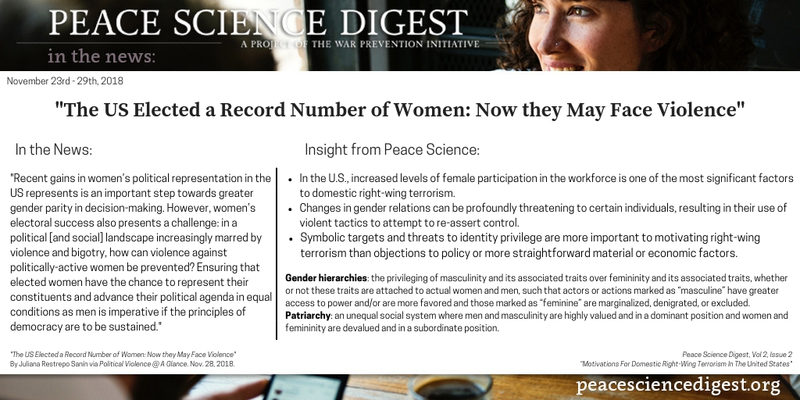 “The US Elected a Record Number of Women: Now they May Face Violence” By Juliana Restrepo Sanín via Political Violence @ A Glance. Nov. 28, 2018.